Yesterday was World Vegetarian Day and marked the start of Vegetarian awareness month so I thought I’d share one of my favorite ways to serve up a tasty vegan salad without animal products. 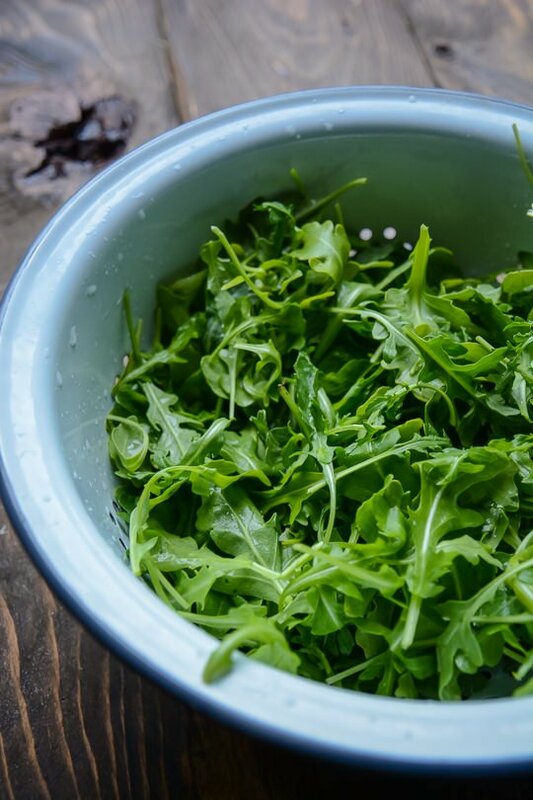 I love using fresh and seasonal fruit to up the nutrition and taste of salads. Small markets can be a great place to find inspiration and unusual ingredients. I found some fresh pistachios this week and couldn’t resist bringing some home. They have such a delicate flavor and texture compared to what you find on the typical supermarket shelf. The dressing is nice and light and pairs well with the fruit. While I am not a vegetarian I do love to load my diet with as many fresh fruits and vegetables as possible. I find I feel better and it’s easier to maintain my weight following a mostly vegetarian diet. I’ll be sharing some of my favorite recipes all month long so be sure to check back for more inspiration! 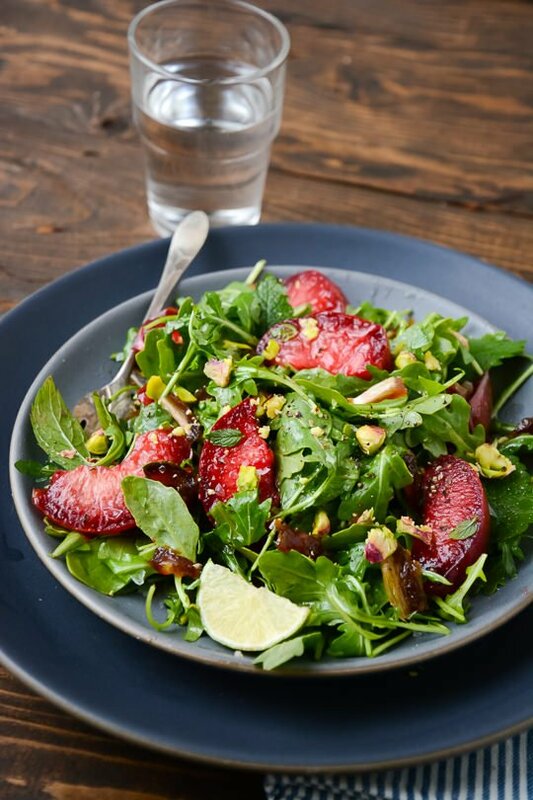 Fresh fruit is a great addition to savory salads. 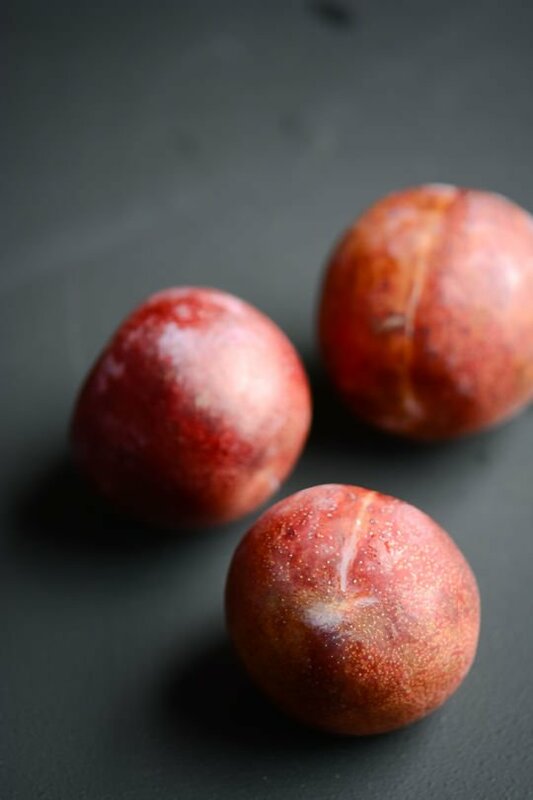 If you can't find fresh plums any of your favorite stone fruits would be a great substitution. In a bowl, whisk the ginger, honey, and lime and slowly whisk in the olive oil until well combined. 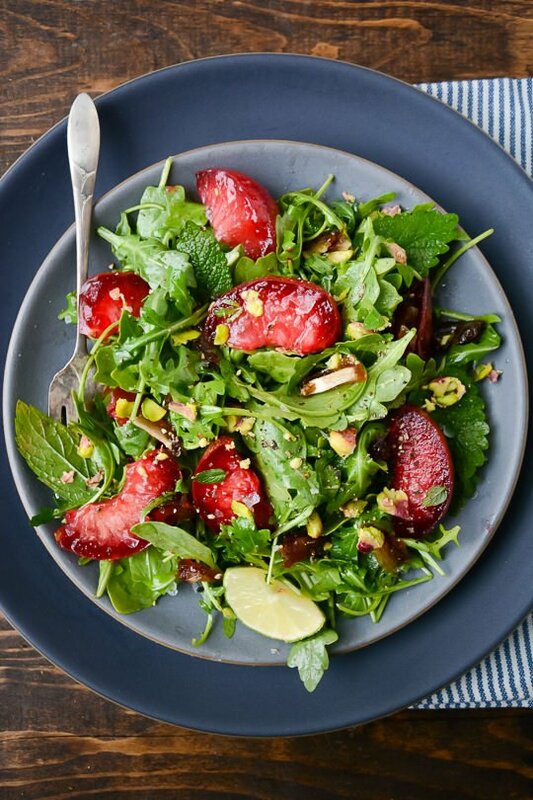 In a large bowl toss the arugula, dates, plums and mint and drizzle the dressing over the top. 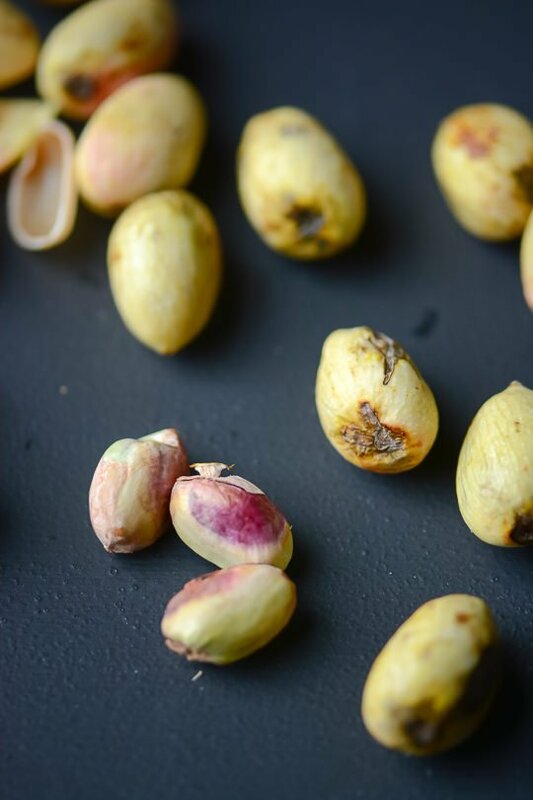 Toss lightly to combine taste and season with salt and pepper as needed and top with the pistachios. What kind of plums are those? 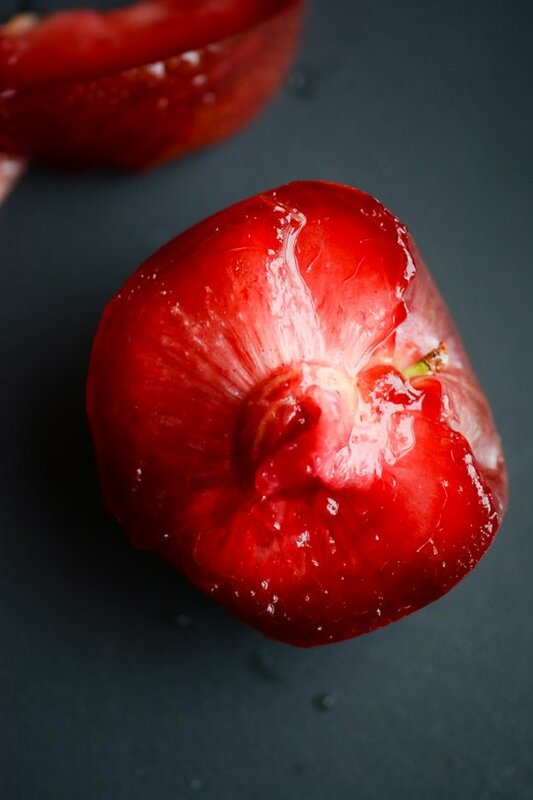 Those plums looks gorgeous. And I love the Asian flair with lime, ginger and mint. 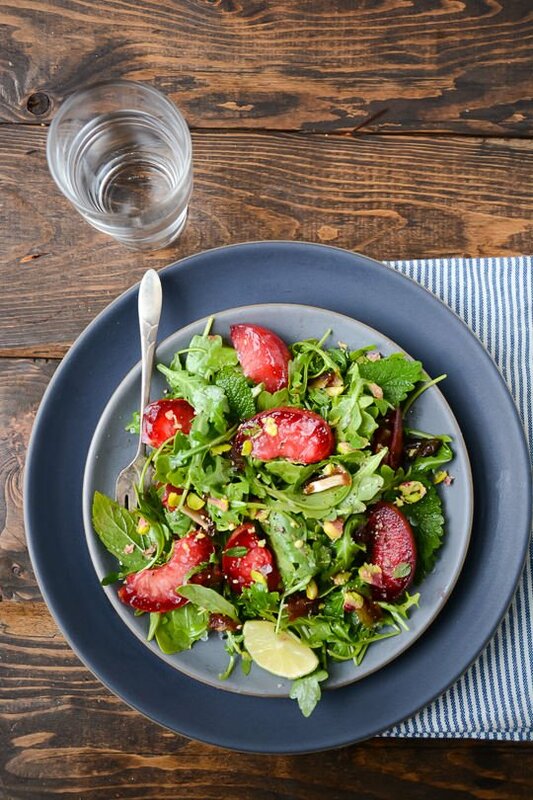 I’ve never really used plums in a recipe before but they were so sweet and were such a nice addition to the salad! What a lovely salad you have here! 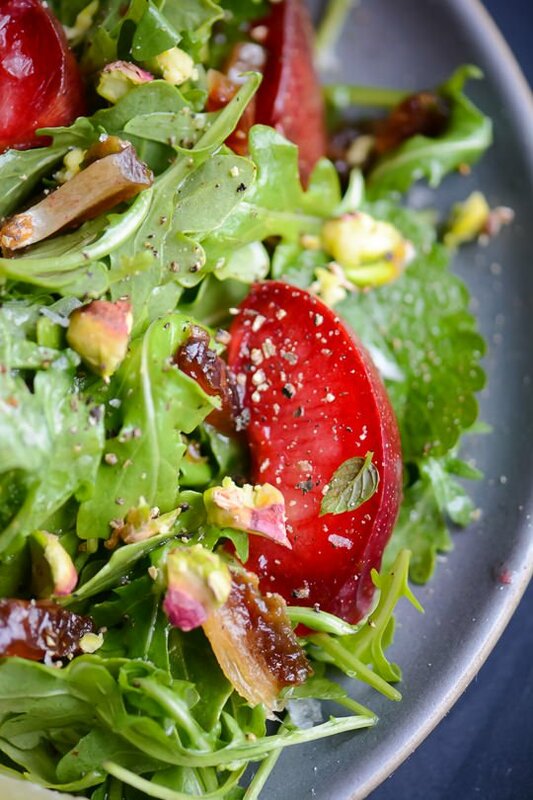 That ginger dressing sounds amazing too – I love plums and ginger together. It makes such a nice light and refreshing lunch! I used to really dislike ginger but it’s becoming one of my favorite ingredients!